Amongst its neighbours, Senegal remains something of an unknown quantity when it comes to the tourism hotspots of West Africa. And yet it is a country which enjoys an almost unending summer and the ultimate in surfing conditions. 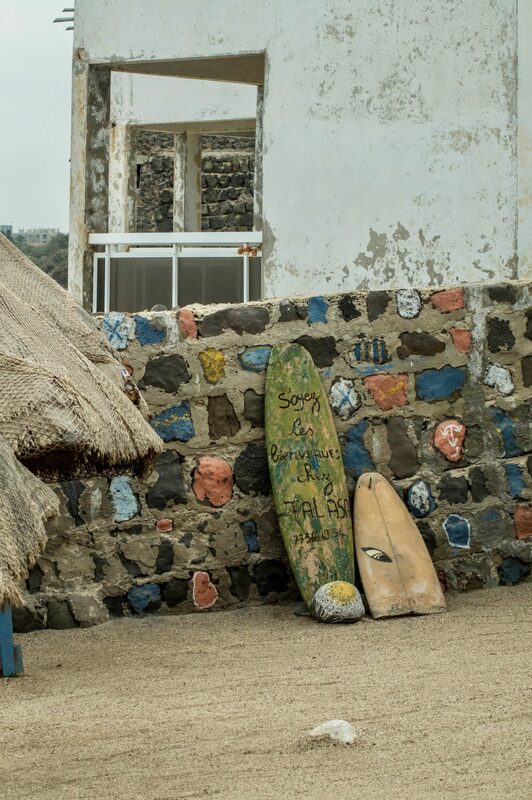 About Senegal surf, the Endless Summer movie and an Italian woman, who calls Senegal home. Nothing remains secret for long, whatever the promise of a name. ‘Secret Point’ is a little wooden cabin, nestled on the point of the same name on a stretch of Senegal’s rugged coastline near Dakar. Here, far from the chaos and smog of the metropolis, is a setting dominated by the glistening blue sea, a succession of colourful plastic seats and reggae music that provides a soundtrack for the surfers out on the Big Blue. The sunlight glares over the raging sea. In the distance, you can hear the rush of immense waves as they crash against the boulders of Les Almadies. 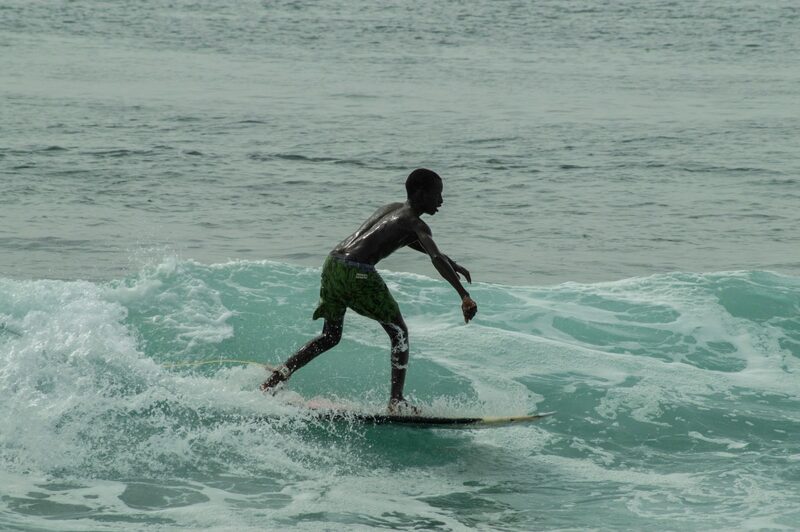 The rumble of the sea all but drowns out the clinking of beer bottles of the day-trippers and travellers who come to marvel at something that has actually existed here for some time: a serious surf scene in the heart of Senegal. It all began back in 1966 with the cult film ‘Endless Summer’, featuring two crazy Californians on the hunt for the perfect wave. 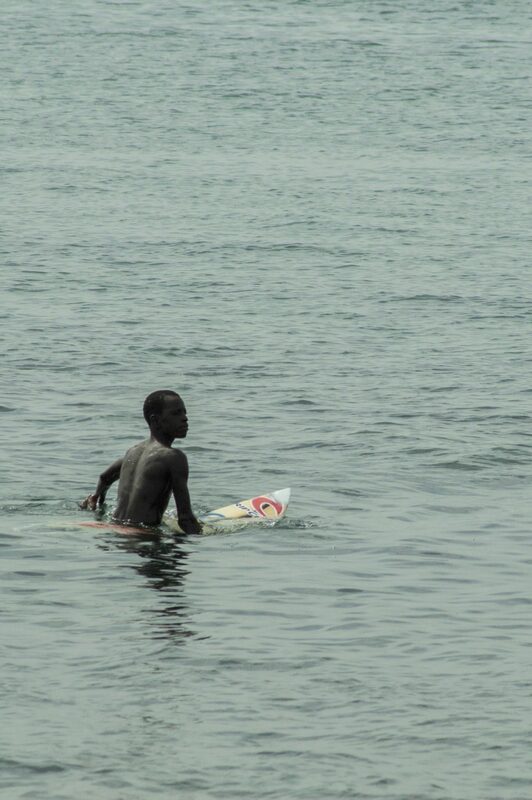 They were to find it– among other places – here in Dakar, which turned out to be home to West Africa’s Ngor Right, a perpetually-breaking dream wave. 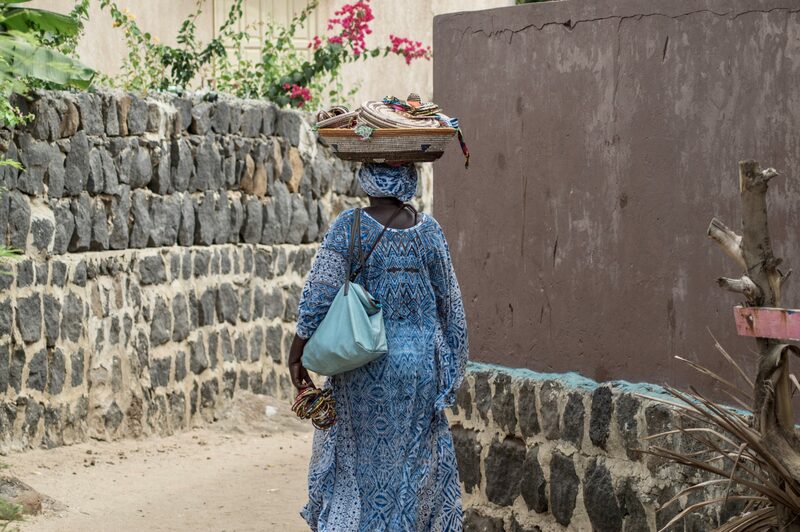 From Secret Point, it’s only a short journey to Ngor Right, an easy day-trip from Dakar. 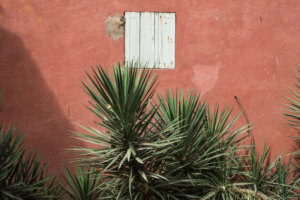 The route leads from the coast near the popular Les Almadies, through the narrow laneways of Ngor. It winds past small, improvised market stalls where clementines are sold, sandy football fields where local children play and homes where the latest round of tea is always being poured. Tea so strong and so sweet, that the spoon can almost stand upright in it. Here and there you can hear a burst of pop music – played too loudly for European ears – interspersed with the thundering of traditional drums and the singing of the local tribeswomen, who gather as they wash, performing their daily chores in concert. 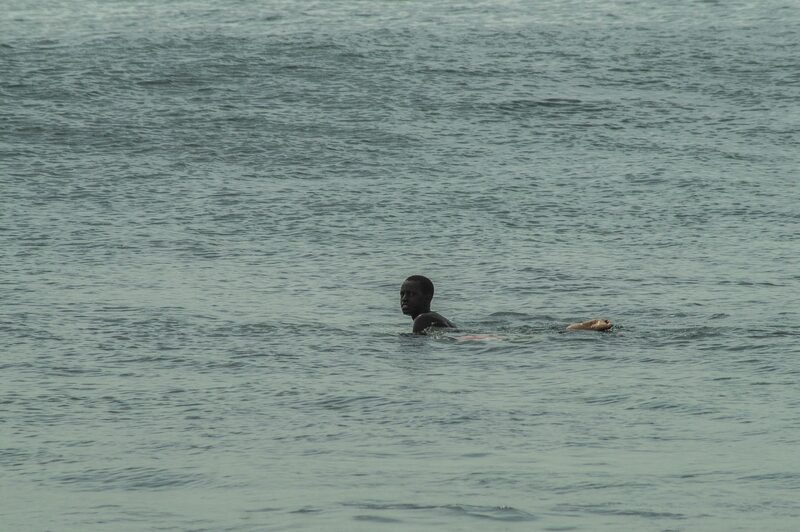 The beach at Ngor is busy all day long. Families go for walks, tourists sit drinking beer after cold beer in the heat of the sun, although it’s barely midday. The street hawkers hope to finally relieve themselves of one of the pairs of rubber flip-flops they’ve been lugging about for months. It’s worth a try, anyway. Those that aren’t drinking or sunbathing are idling along the concrete wall, which offers some shade due to a rusted, overhanging roof. 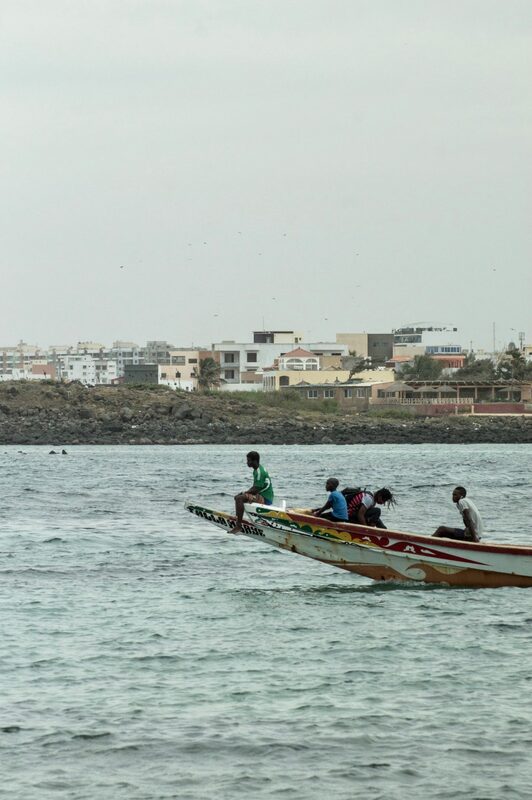 A small group of people waits for the little wooden dinghy which transports tourists and locals alike across to Ngor. No-one really knows exactly when the boat will turn up, but it barely matters, taking things as they come is just a part of the Senegalese lifestyle. A calm, relaxing lifestyle with a minimum of drama. And as they say, come the time, come the boat. Sure enough, a short while later it appears. The captain has his rule: anyone not wearing a bright orange life vest is not allowed on board. It’s that simple. The journey may only take a few minutes but it seems like setting sail. Ngor Island, located off the coast of Cabo Verde, is one of Dakar’s best loved tourist destinations. The beach is lined with a row of small wooden huts, where fresh fish is grilled to order from early in the morning, whilst water-pipes are smoked and ice-cold cokes sipped under the hot son. Ever-optimistic street hawkers mingle about, hoping to find takers for their brightly-coloured, handwoven baskets. And then suddenly, through a small, sandy lane, the rumbling grows louder. It is here that the waves of the famous Ngor Right crash into the shore. Ngor island’s potential was recognised several years ago by a Danish visitor, Jesper Mouritzen. 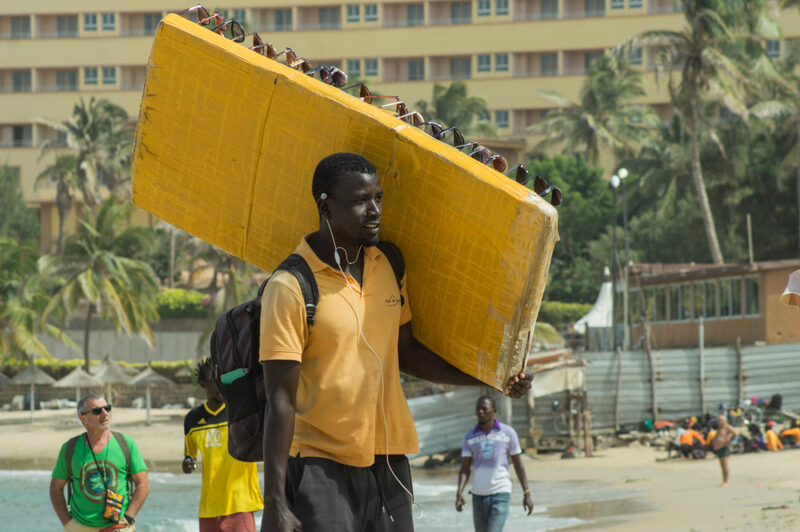 He decided to take over Ngor‘s Surfcamp and give it a fresh lick of paint. Since then, he’s been offering surf camps and surf courses that have drawn visitors here from all over the world. 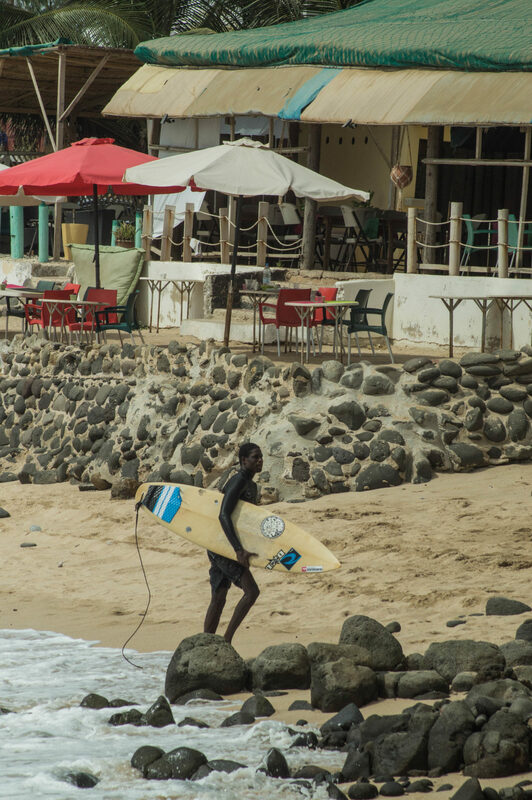 In comparison to its neighbours, Senegal is no longer an empty page when it comes to its tourism industry, and a surf scene is steadily gaining momentum right here. 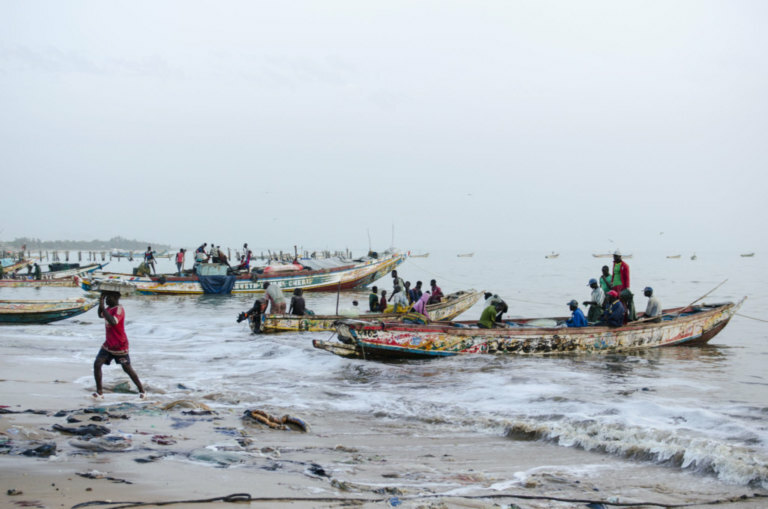 Yoff, located on the coast just to the north of Dakar, remains one of the most important harbours for Senegal’s fishing industry. This is largely due to its position in the midst of a large bay, which attracts more than just surfers – large quantities of swordfish and tuna are caught here. On days when it’s almost too rough for the fishermen, Marta will grab her board and paddle out onto the open sea. She isn’t fazed by the strong winds or the untameable surf. She’s more interested in the atmosphere out there on the water, which is what makes surfing in Senegal truly special. “I love to surf with the locals, it’s just so unique. They are always laughing, they surf in a completely carefree way. They are a wonderful inspiration and a motivation. If it weren’t for them, I probably wouldn’t dare to venture out in such bad weather. But when I see them heading out, I want to go, too”, Marta explains. For the past 8 years, she has been running her Surfcamp, hiring mainly locals, who are keen to support her. 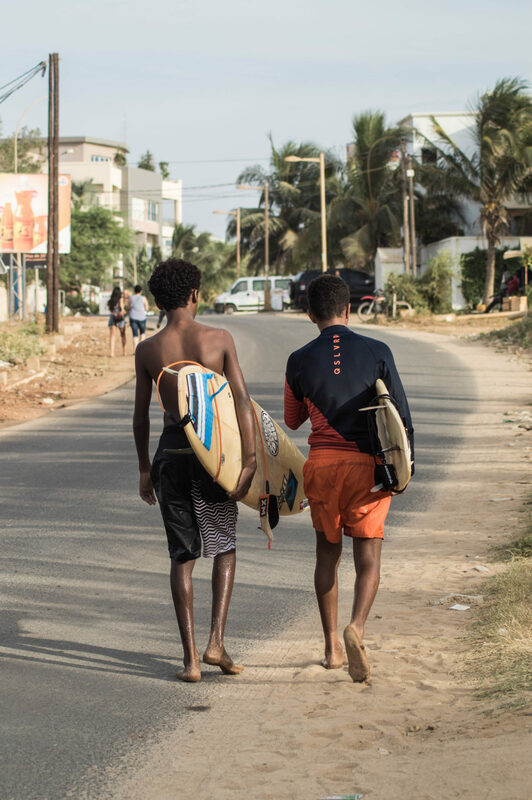 They too have recognised that there’s more to the surfing than just an „Endless Summer“, and in Senegal, every day might as well be summer anyway. 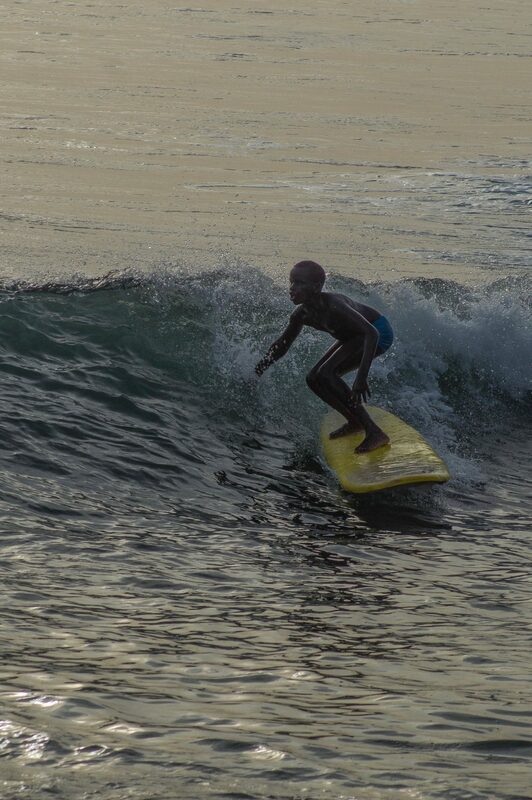 “Lately, young Senegalese boys and girls are getting more and more into the surfing. They want to learn more about the surf culture, about how to set up a surf business and above all, about what goes on at international surf events. Recently someone was asking me about how you can read waves and accurately assess the wind“, Marta says. Before, surfing here was just something people did for fun, a pastime for those summer days that were so hot, you didn’t want to venture out of the water. At Secret Point the sun is slowly setting. There are fewer and fewer surfers out on the sea. The kids in the bar turn up the music, their conversations grow more animated and they move in time to the reggae. It’s a mixed crowd, just like the Line-up out on the waves. Europeans, Americans, locals and African travellers watch the daylight fade away at their private place, the Secret Point, before heading back to the chaos of Dakar, where the air is close and the sound of car horns echoes through the night. 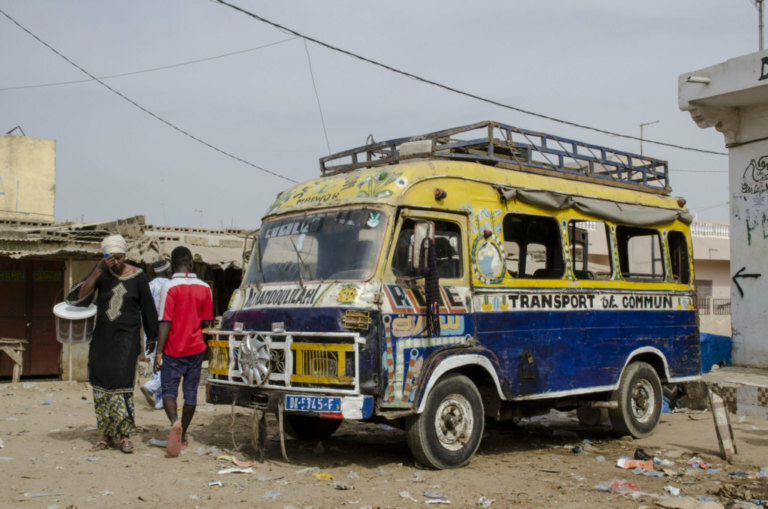 More information about Senegal can be found here on Travellers Archive:From visiting the Sine Saloum Delta over the fish market Mbour to taking the bus from Dakar to Mbour, Petite Cote, Senegal. Im not brave enough to surf but Id still love to visit it looks so lovely! Hey Jillian, you should try it once though. It’s real fun and truly good for your mental health – promise! Hey Ann! Thank you! Sure, please do go. This country is worth travelling to and full of stories. Let us know if you need some help in organising your trip. Greetings.